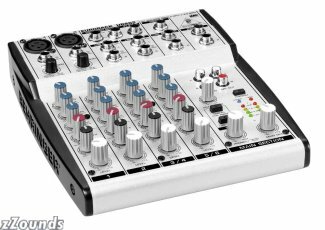 So, why am I buying the Behringer UB802 Eurorack 8 Input Mixer? As many of you know, I've been experimenting with doing some home recordings of some of my songs, perhaps even to be able to produce a demo CD. I own an eMac, which is cool enough, but I also have GarageBand, an easy-to-use and dirt cheap digital recording application. I've have plenty of success recording from my keyboard -- actually, I'm recording MIDI notes from the keyboard, not its actual sounds -- and you can even listen to and download two of my songs over at my downloads page. But I have not been able to record any good vocals. The problem is one of impedance. professional-level microphones are typically low-impedance signal devices. ... As such, if you plug a good quality mic directly into your Mac, you won't hear anything. And I wasn't hearing anything. I needed something to boost that microphone signal so my Mac could hear it. And the Behringer UB802 Eurorack 8 Input Mixer does just that. But it doesn't do just that. The Behringer UB802 Eurorack 8 Input Mixer also has separate EQ channels for each track. EQ is just music-geek for equalization, which is still music-geek for the adjustment of highs and lows of sound. Simple EQ adjustments are your treble and bass knobs on your car radio. By using the Behringer UB802 Eurorack 8 Input Mixer at my gigs, I can adjust the highs and lows of my vocals separately from the highs and lows of my piano, so if my vocals are too "bass-y" and the piano is too "treble-y," I can adjust each. Which means a better-sounding gig for you.